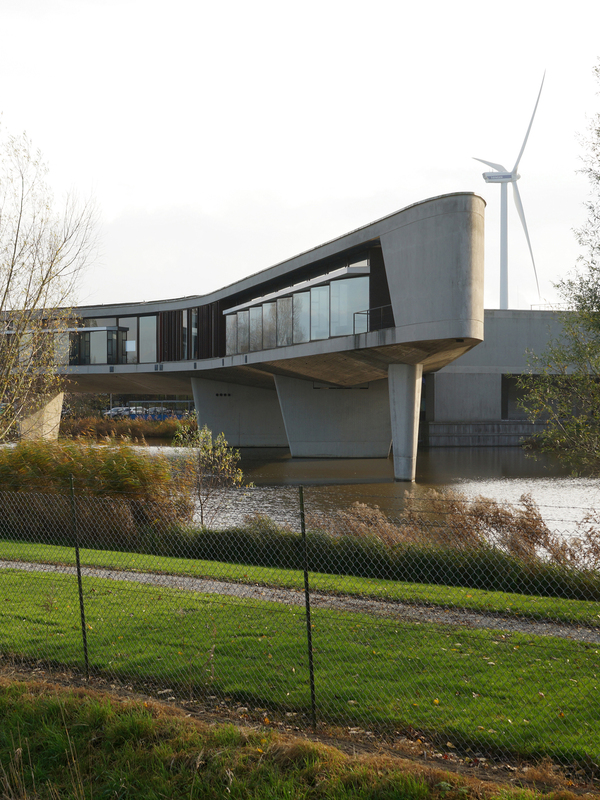 SC Johnson’s Europlant in the Netherlands embodies modernism, architectural excellence and environmental leadership. Known affectionately as “the boomerang,” SC Johnson’s Europlant seems to fly over the pond below. 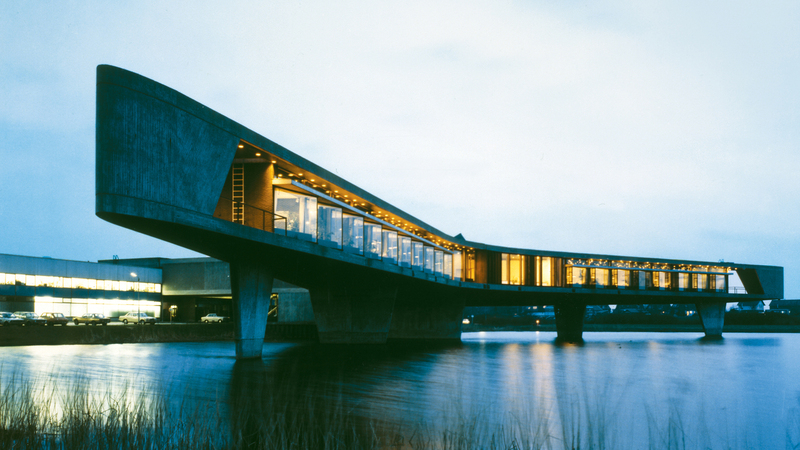 When people talk about the inspiring architecture of SC Johnson, they often bring up our Frank Lloyd Wright-designed corporate headquarters. But the Wright buildings are not our only architectural treasures. In fact, one of our most interesting sites around the world is Europlant and its remarkably shaped administration wing. Known affectionately as “the boomerang,” Europlant is an architectural marvel in Mijdrecht, the Netherlands. Designed by the architectural firm Maaskant, Van Dommelen, Kroos and Senf in the early 1960s, Europlant’s administration wing is a stunning concrete sculpture, flying above an ornamental pond. The wing seems almost free-standing, but is connected by a corridor to our manufacturing facility, which is our largest in Europe. Europlant produces about 400 million products each year. 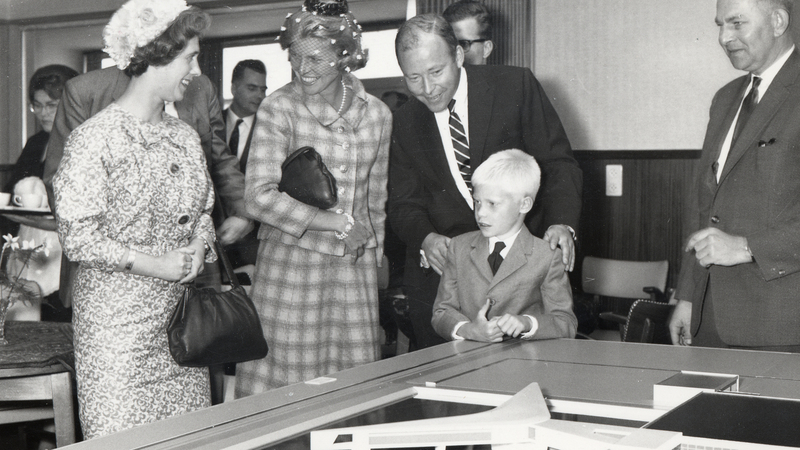 Sam Johnson and family, centre, look at an architectural model of Europlant during a ground-breaking event in 1963. The pond under Europlant’s administration wing is filled by 16 natural wells, providing a renewable water supply for fire safety. In fact, all water used on-site at Europlant is recycled. The site also has 9 hectares of trees, which were planted as part of a tree cultivation programme to cut CO2. Europlant is also home to one of SC Johnson’s largest wind energy projects. Our first company-owned wind turbine was installed there in 2009. The 80-meter tall turbine generates about half the energy needed to run Europlant, while the remaining energy is purchased wind power. Since it first opened in 1964, the Europlant team has continuously searched for new ways to run more efficiently and sustainably. Today it is one of numerous SC Johnson sites that send zero waste to landfill. So, what was said of Europlant in the 1960s remains as true today as it was then: It stands as a symbol of a dynamic, forward-looking company, ready to keep flying toward the future.